Discover how these worlds collide in this Transformers-Ghostbusters mash-up pack! The iconic Ecto-1 Cadillac from the 1984 Ghostbusters movie is now a Transformers robot -- a converting Paranormal Investigator, called Ectotron! This Ectotron figure comes with his own Proton Pack accessory and a Slimer accessory, and converts between Ecto-1 and robot modes in 22 steps. Includes: Ectotron figure, Slimer figure, 2 accessories, and instructions. 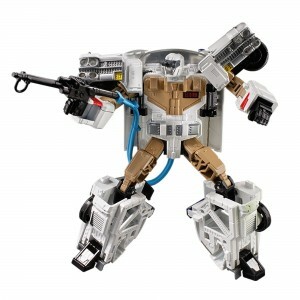 Commemorate 35 years of both Transformers and Ghostbusters with 1 awesome figure! Convert Ecto-1 Cadillac mode to Ectotron robot mode in 22 steps. Features classic Tech Specs showing the capabilities of Ectotron, including strength, speed, and ghostbustabilty. Cadillac and all related Emblems and vehicle body designs are General Motors Trademarks used under license to Hasbro Inc.
A direct link to the pre-order can be found here. So what do you think of this odd turn of events? Do we have any Ghostbusters here? Excited by this mash-up? Tired of mash-ups already? Click the jump and sound off in the Energon Pubs! This is just super dorky, and unlike Transformers and GI Joe crossovers this really cool. I'm not super into ghost busters, but I may purchase him. They made this work really well. Well that's a very random crossover. Can't say I like that robot mode too much but it's cute it has the gun and tube and such. The Ecto-1 looks great though. Just not into the bot. I pre-ordered the Fell out of this guy! Hope they do more in the future! I'm not going mad- that's definitely Hot Spot under there, right? ArmadaPrime wrote: I'm not going mad- that's definitely Hot Spot under there, right? I see what everyone is seeing to make one think it could be. Shapes, and transformation. But, I don't think it is. Maybe more of a case of "shared engineering"? It's hard to say. Now that was truly unexpected. I'd like it, but not if it's some sort of US exclusive that must be imported at high cost. this is actually pretty cool - not a super robot mode (and seems to use the CW engineering patterns). The alt mode though looks the part and I appreciate the robot mode is an original character. Didn't care for the other transformers where for example a TIE fighter would transform into Vader... rather than an original character or a TF character like Megatron. Wow, I cannot escape buying this mould 4 times can I? If it isn't an extreme retool, it definitely shares engineering. Oookay this came out of nowhere. I like the concept tho, and seeing that this gonna be a line, not just one-off, i am kinda worried, because while i can resist this just fine, i'm pretty sure there will be some down the line that will mess up my budget plan. Anyone else think that this guy has hurtful shoulders and an addiction to Jaam? Because I am totally getting the Hot Shot vibe from this. Car mode looks great, robot mode... not so great. Dunno, but it seems like a knockoff. Also, the "Transformers Collaborative" signature means we can expect more crossovers? The BTTF Delorean and KITT are PRIORITIES. The rest would be nice to have. Would Christine make for a nice Shatter? There are worse molds. Like... Most of them. Most of the moulds are worse. I have this mould six-times. Had to make a new account tho, this site is new from HasbroToyShop? YES to the Blaster Master mash up! Kind of, but at this point does it really matter? Cool mash up. Kind of like the mash up I did. Which I’m surprised that it hasn’t been done since Hasbro now own Power Rangers.